More than fifty Canadian families have become Chai Founders of Boys Town Jerusalem and you can join this illustrious group of supporters. In favour of a gift of eighteen thousand dollars ($18,000. ), or more, you will be recognized as a Chai Founder. Your gift/pledge may be paid in up to three years and you will receive a charitable donation receipt for your very generous gift. Your name will be permanently placed on the beautiful Tree of Life that graces the main lobby of the school and your gift will be permanently endowed. Our students will benefit from your generosity forever. For more information please Click Here. Countless numbers of friends of Boys Town have become Friends for Life at Boys Town Jerusalem. In favour of a gift of ten thousand dollars ($10,000. ), you can join this illustrious group of supporters. Your gift/pledge may be paid in up to two years and you will receive a charitable donation receipt for your very generous gift. 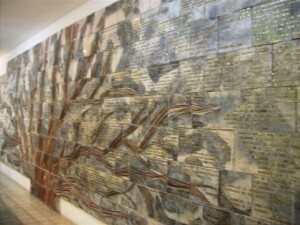 Your name will be permanently placed on the Menorah Wall that graces the main lobby of the school. Deserving students will benefit from your generosity. For more information please Click Here. Jerusalem has been the focus of the aspirations and prayers of the Jewish people for thousands of years. Now, you can link your name, and the names of your children and grandchildren, for eternity to the holy city of Jerusalem through your membership in Boys Town Jerusalem’s Dor L’Dor Society. The Dor L’Dor Society is a select group of Boys Town Jerusalem supporters who are concerned about the future of the Jewish people, and who demonstrate their family’s commitment to Israel, Jerusalem, and educating Israel’s poor and needy with a generous gift $1,800. In recognition of your membership in the Dor L’Dor Society, your name and the names of your children and grandchildren will be permanently inscribed on our beautiful Dor L’Dor Wall on Boys Town Jerusalem’s 18 acre campus overlooking the ancient Judean hills. Your children and grandchildren have an open invitation to visit one of Israel’s premier educational institutions, and continue your legacy of support and kindness for the disadvantaged students who consider Boys Town Jerusalem their home away from home. Your children and grandchildren will see that their connection to Boys Town Jerusalem reflects the values that you hold most dear – your love of Israel and the holy city of Jerusalem, your passionate concern for your fellow Jew, and your commitment to those less fortunate. For more information about the Dor L’Dor Society please contact us. “A Sage encountered an elderly man planting a carob tree. 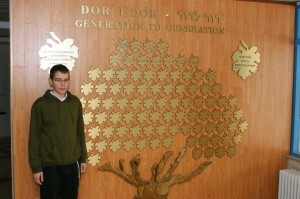 Dorot means generations; continuity; a legacy and a vision. For the disadvantaged students at Boys Town Jerusalem, it means hope and a promising tomorrow. Welcome to the Dorot Society, an elite group of forward thinking supporters of Boys Town Jerusalem who recognize the urgency to plan for future generations in Israel. By including Boys Town Jerusalem in your estate planning and by leaving a legacy gift to our school – a bequest, a charitable gift annuity, a gift of stock or an insurance policy – you will immediately become a member of Dorot Society. Your legacy will link your name forever to the successes of our students forever. Dorot Society members’ names are prominently displayed on the beautiful Wall of Eternity on the Boys Town Jerusalem campus. Please consider joining this prestigious society and ensure that Boys Town Jerusalem will fulfill its essential mission for generations to come.